Which is consistent with Metra saying it takes 6 minutes. Reading this indicates a bit of chicken and egg. Currently, reverse commute trains go to or from Deerfield, and fill in gaps when the single track to Fox Lake can't support reverse service. Looks like Metra got better signals and private funding to run a couple of trains to Lake Forest and will put in the crossover later. However, unless Abbvie and others provide private shuttles (I was told at one time that Abbott did to Waukegan), it isn't going to accomplish much, as this gets the train about 3 miles further into Lake County, while a Wadsworth extension would go right past Abbort Park. A fair point, but most of the potential passengers are currently driving to work and could presumably continue to do so. Neither the Deerfield nor Lake Forest station is walking distance to much work. Abbott Park, which was mentioned in the article, is about 8 miles from the Lake Forest MilwN station. Only employers near the Lake Forest station are Sunset Foods, a NorthShore Health System where Lovell's used to be, a couple of bank branches, and the world's most architecturally correct Mickey D's. As I said above, a shuttle is needed for the Lake Forest extension to make any sense. A lot of the north suburban office shuttles are jointly funded by Pace, Lake Cook TMA (private sector partnership) and the companies. Looking further into this expanded service, the news for the reverse commuters is the new early AM train leaving Chicago at 5:35 AM. 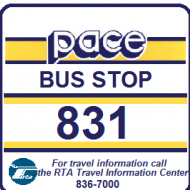 I believe that a few years ago, Metra and Pace collaborated (unsuccessfully) to create the early morning 638 bus to serve this market. Also, these reverse commute improvements enable some regular commute improvements. The afternoon express trips from the north suburbs to downtown will probably also be well received. I did some internet sleuthing, and it looks like Abbott has their own private shuttle system that connects to the Metra stations. So, they may be planning to take advantage of the new run to get people into work for the 7 am hour. I believe that a few years ago, Metra and Pace collaborated (unsuccessfully) to create the early morning 638 bus to serve this market. It was 618, and didn't last long. Intent was to get to Lake-Cook by 6 a.m., so this is about the same time frame. Tribune suburban article with more details, including financing and the times of the additional trains.There's also a picture of corporate shuttle buses using the Lake Forest station, which answers one of my questions.